President Tayyip Erdogan indicated that Turkey was discussing alternate bids for its missile defense system. Turkey is re-thinking its decision to purchase a long-range missile defense system from China, Reuters reports, citing comments made by Turkish President Recep Tayyip Erdogan to the television channel NTV. Turkey is seeking to buy a surface-to-air missile that can be used for anti-missile defense and is willing to devote up to $4 billion to the project. Despite the announcement in September 2013, the Turkish government has been sending signals that the decision was not quite a done deal. Turkey asked for bids to be re-submitted in May, and apparently Turkey found French-Italian firm Eurosam’s new bid enticing. “Our talks with France are continuing,” Erdogan indicated, even while noting that negotiations with the Chinese firm were on-going as well. Some analysts, including Denise Der for The Diplomat, wrote that increased political pressure from NATO could have made Turkey reconsider its choice of the Chinese companies. As an added inducement for Turkey to changes its mind, NATO would have refused to cover the cost of integrating a Chinese-manufactured missile defense system with NATO’s network. These political and financial factors undoubtedly played a role in Turkey’s calculus, but it seems the ultimate reason for Ankara’s change of heart may have been far simpler. When Turkey first announced its preference for CPMEIC, Aaron Stein, the nonproliferation program manager at the Istanbul-based Center for Economics and Foreign Policy Studies, told The Diplomat that he believed China had won out because of its willingness to accept Turkey’s requirements for co-production. 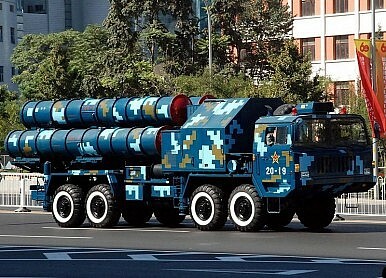 Co-production of the missiles was seen as part of a larger strategy to build up Turkey’s domestic defense industries, and as such a high priority for Ankara. Stein mentioned “Turkey’s very demanding technology transfer demands” as a reason U.S. firms lost out on the bid. It now appears that CPMEIC was also not willing to live up to Turkey’s standards for co-production. In his comments, Erdogan said that “some disagreements have emerged with China on the issues of joint production and know-how during negotiations over the missile defense system.” He added, “For us, joint production is very, very important.” If CPMEIC balked at the requirement for co-production, Ankara may have decided to go back to square one rather than continuing with the contract. Still, the news that Turkey is pursuing other options does not guarantee that the Chinese firm will ultimately lose the contract. It may simply be a negotiating tactic designed to get CPMEIC to agree to Turkey’s terms. As Denise Der pointed out back in May, the CPMEIC bid was attractive to Turkey both in terms of price (only $3.4 billion, coming in well under budget) and capabilities. If Turkey can now get a renewed commitment to co-production, it may stick with CPMEIC despite NATO protestations. Erodgan's pursuit of China amid worsening ties with the West could have negative consequences for Turkey. China's Answer to the US Military-Industrial ComplexIn Turkey, US Loss Is China's GainAfter the Failed Coup: A New Dawn for China-Turkey Relations?After Paris Attacks, China Seeks More International Help Fighting Xinjiang SeparatistsCan China-Turkey Relations Move On?